Tape Sialk is part of the Tentative list of Iran in order to qualify for inclusion in the World Heritage List. The inscription of Ziggurats at Ur, Uruk and Tel Eridu in 2016 within the Ahwar of S Iraq added to those already inscribed at Ashur and Tchogha Zanbil and thus created a “cluster” of inscribed Ziggurats! It therefore seems worth reviewing the Iranian T List site of Tape Sialk which was visited by us in May 2016. Why? 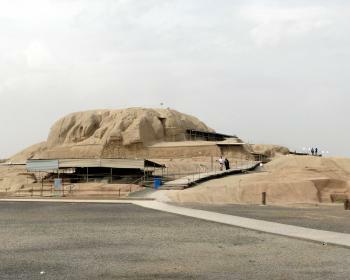 Because it is claimed to contain the “oldest known” Ziggurat, dating back to around 3000BC. (e.g Fr Wiki “Au niveau Sialk IV, on trouve également les ruines de ce qui serait la plus vieille Ziggourat du monde”). This claim came as something of a surprise to us when planning which Iranian T List sites to visit. Sialk lies in a suburb of the city of Kashan, situated 1000m up on the Iranian plateau, around 250kms south of Tehran and some 600kms away from the ziggurat of Tchogha Zanbil and even further from the “Ziggurat heartland” of Mesopotamia. Kashan already has one inscribed site in the form of the Fin Garden (part of the Persian Gardens) and is within another T List entry titled “The Historical-Cultural Axis of Fin, Sialk, Kashan”. This was added to Iran’s T List in 2007 (“Tape Sialk” has been present since 1997) and appears to encompass the full range of Kashan’s historical remains stretching from “proto-Elamite”/Elamite Sialk, through an 11thC Jame Mosque and Seljuk walls, the Safavid Fin Garden (1590) and on to some rather fine 18th/19th C residences. In fact, following a major earthquake in 1778, the representation of periods between Sialk and the post earthquake Qajari (re)constructions (which include much of Fin garden) is a bit thin and the city centre’s main stars are these more recent works. I have chosen to review Sialk in its “stand-alone” T List form as I am not sure whether to bother with a review of the wider entry! Kashan is situated on the main route between Tehran and Isfahan or Yazd and is also near the T List tourist village of Abyaneh. If you pass by you will face the decision as to whether to call in at all or whether to stay overnight to give more time for the various “attractions”. We had just one day to get between Isfahan and Tehran by car and managed to fit in Abyaneh, Kashan, Fin Garden AND Tape Sialk – but it was a “push”, missing out the holy city of Qom which, luckily, I had seen on an earlier visit, and a very late arrival in Tehran. So, if you do “call in” should you bother with Sialk? The impression I got from our guide and from various group itineraries I have seen, is that Sialk is very much the fourth priority for most tours of the Kashan area behind Abyaneh, the city centre and Fin Garden. It is situated c4kms from the historic centre, around half way along the main route out to Fin and the main Isfahan/Tehran highway so is relatively easy to take in if you visit Fin and the city. Entrance fees are set at the second highest level for sites in Iran at IR 150000 and, for many people, what is actually on show might not be enough to justify either this or the time it will take - 1 hour max and probably less. The site exudes an air of decrepitude and is closely surrounded by recent housing. There are in fact 2 “Tapes” or hills - North and South, but only the larger (and “newer”) Southern one is officially “open”. Beyond the official ticket office at the fence is a “portacabin” structure containing a few articles which could be said to constitute a “museum” and from where tickets were actually sold when we visited. More interestingly, the old guy “in charge” spoke French and had been involved in excavating the site, so was interesting to talk to. His work didn’t of course date back to the time of the earliest excavations which were carried out by the French/Ukrainian archaeologist Ghirshman in the 1930s but, as my review of Susa explains, France had established “primacy” in Iranian archaeological matters through to the 1979 revolution via the “Insitut Francais de Recherche en Iran”. I showed him my photos taken the previous year at Çatalhöyük with its enormous protective structure and he bemoaned the poor state of preservation of Tape Sialk in comparison - both sites date back to the earliest periods of human “settlement”. He had also visited the Louvre which houses a number of articles excavated from Sialk and indicated that, in reality, it had probably been better that they had been so taken away and preserved! The “visit” consists of a rough trail up one side of the mound (photo), across the top and round back to the starting point. At the summit, the north mound can be seen around 600m away - with housing between! Steps are provided by railway sleepers and the route is demarcated by ropes and scaffolding poles - all a bit “basic”. At the bottom, a shelter has been erected over a couple of coffin-sized plastic “cases” containing, apparently original, human skeletons laid out as in their burial and said to date back to 5500BC - not really well secured! Some evidence can be made out of a “shape” within the rather formless mound via some excavated walls and 3 levels of the Ziggurat are said to be visible. Which takes us to the issue of whether this really IS the remains of a Ziggurat, let alone the earliest known! As mentioned above, Wiki calls it thus and numerous other Web sites follow suit (of which these are typical even to the extent that one has obviously copied the other - http://www.crystalinks.com/pyramidiraq.html and http://english.irib.ir/radioculture/iran/history/item/171800-sialk-ziggurats ) - but, as we know, the Web isn’t always Gospel! Indeed, the very limited descriptions on the UNESCO web site of 2 T List entries which include Sialk fail (significantly??) to use the word “Ziggurat” at all. On the other hand, the Web version of the Encylopaedia Iranica (an excellent source on Iranian Archaeological matters) says this - “Roman Ghirshman …… dated the site to the Early Iron Age, and considered the monument a “grande construction.” Based on new excavations in the early 2000s, S. M. Shahmirzadi has proposed to consider this site a ziggurat dating to the Proto-Elamite Layer IV. But his date is based on pottery uncovered exclusively in the debris surrounding the monument, and his interpretation has been widely rejected as pure speculation. Neither the reconstruction of this monument as a ziggurat nor its dating to the beginning of the 3rd millennium BCE is accepted in the archaeological literature”!! The on-site notice boards are inconclusive - “Dr SM Shahmirazdi described the mud brick structure over the south mound as the oldest known ziggurat in Iran. The Ziggurat of Sialk which has now elevated as high as 16m made of 3 story platform and pavement in the south side as well as a possible ramp. Prof R Ghirshman believed that Sialk structure could be contemporary with Cemetery B and described it as an “Acropolis”. However, any further information on the precise date and function of the structure requires further investigations”. Now a “Ziggurat” is believed to have been purely a “Temple” (whereas the purpose of the similarly shaped Egyptian pyramids was to be a “Tomb”) so it might be somewhat surprising that bodies have been discovered buried under this so called Ziggurat. The argument appears to be that Sialk consists of the remains of settlements going back way beyond the creation of the Ziggurat which was constructed on top of/near part of them. And what of the fact that all other ziggurats are sited far away in Mesopotamia? Well, the Elamite civilization to which such Ziggurats belonged grew out of a range of proto-Elamite roots often situated beyond its later core area. So, with the Ziggurats at Ur dating to 2100BC and at Tchogha Zanbil to 1250BC, there was plenty of time for cultural diffusion and development of this basic structure. Wiki has a reasonably useful summary of the development of what is now called “Elamite” Civilisation here - https://en.wikipedia.org/wiki/Elam#Proto-Elamite . All of this of course still leaves open whether Sialk was or was not the site of the oldest known Ziggurat – or even of a Ziggurat at all! Even if you don’t keep a “Seen Ziggurat” travel list, the site is of archaeological significance in terms of its very early roots and of the fact that the Louvre, the British Museum (and others) have decorated pottery articles from it “on show”. If you intend visiting the Tehran National Museum it has a particularly fine display demonstrating the importance of the site - with or without “Ziggurat”! And what of its chances of ever gaining inscription? Well, its condition and management is not good but, no doubt, Iran could improve that. A possible clue to its archaeological value might be found in the Nomination Dossier (ND) for Susa which uses it as one of the comparison sites to establish Susa’s own OUV. A potential problem is that the purpose of such comparisons is to try to “rubbish” the other sites and “max up” the nominated one! So, unless it resiles from these Susa ND claims, Iran would seem to have burnt its boats regarding future claims for OUV on similar lines for Sialk! Which leaves the possibility of finding a new angle - and, presumably, the “Historical Axis” T List entry is an attempt to do. However, an obvious problem with linking together Fin Garden, Sialk and Kashan in a single nomination would seem to be that the various elements don’t really demonstrate cultural continuity on the same site - just in the same area. Is that going to be enough?